How do I switch off and store away my Laurastar? - To switch off your Laurastar, press the on/off switch and unplug the appliance. - Remove the iron protective soleplate when it is still hot and place it on a heat-resistant surface. Clean it once it has cooled down. - Put away the hot iron in its security box and close it. - Remove and place the steam cord holder in its horizontal position. - Adjust the board to its highest position, fold it and store it away. Tip: Check for any condensation under the cover before tidying it away and leave it to dry, if necessary. Warning: if the ironing system is stored away face up, the cold water tank must first be emptied. - To switch off your Laurastar, press the on/off switch, unplug the appliance and then remove the steam cord holder. Water may be left in the ironing system until the next use. - Place the iron in the basket and slide the basket underneath the board. Warning: Let the appliance cool down for at least 2 hours before storing it away. 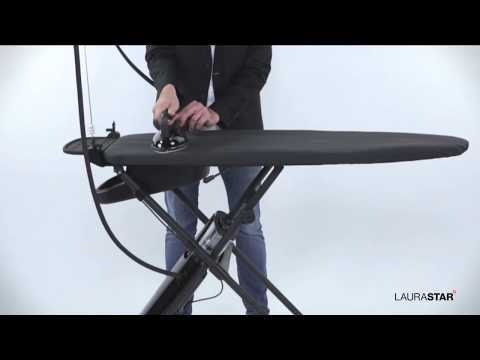 - Lift the ironing board horizontally, holding it by both ends. The weight of the steam generator will cause the appliance to close; if necessary, guide it with your foot. Close the board vertically. - Switch off the appliance by pressing the on/off switch and unplugging the plug from the outlet. - Let the steam station cool down for at least 2 hours before storing it away. Water can be left in the tank until the next use. - Place the insulating mat back on the station, then the iron. - Roll the electric cable, as well as the steam cord around the appliance. For the Laurastar Lift + models, pull on the electric cable to activate the automatic roll-up and wrap the steam cord around the appliance.